Join us for this special theatrical preview in advance of the September 7th televised broadcast as part of the PBS American Masters series. WYETH is a stunningly beautiful film that that uses footage inspired by Andrew Wyeth’s artwork to tell his life’s story. Coming from a family of successful artists, including his commanding father, N.C. Wyeth, Andrew Wyeth was raised to be an artist. Unprecedented access to archival footage from the Wyeth family reveals his early immersion in a creative world. 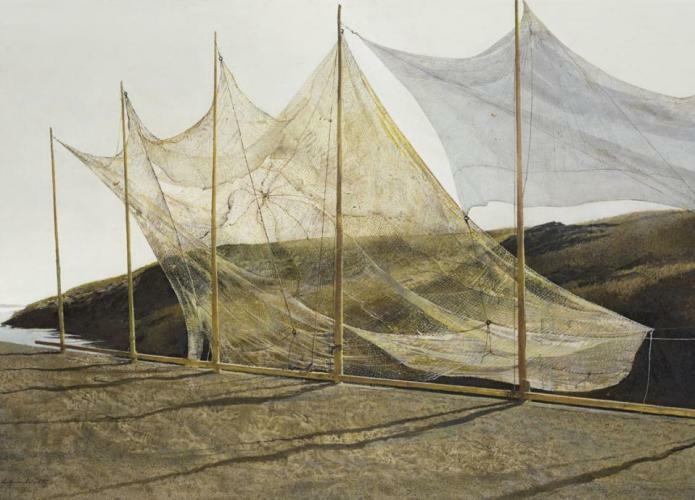 Andrew Wyeth exhibitions consistently broke attendance records at the most prestigious art museums across the country. Detailing the stunning drawings and powerful portraits created in Pennsylvania and on the coast of Maine, WYETH will show the artist’s mastery of the form and why his work appealed to audiences around the world. Remarkably, the filmmaking team has access to many of the locations that provided continual inspiration to Andrew Wyeth during his lifetime. Our cameras visit these places—his studio and the Kuerner Farm in Chadds Ford, PA, the Olson House in Cushing, Maine (the location for his famous Christina’s World)— and lovingly bring them to life. He confidently continued to paint the people and places he knew, undeterred by the dramatic evolution of the art world. His sensational paintings of Helga Testorf landed cover stories in both Time and Newsweek. Interviews with family and friends—including Helga—demonstrate the effect on Andrew of living and working in the public eye. Now, with the distance of time, art critics and historians are rediscovering and reinterpreting his work. Layers of complexity in the art are revealed and celebrated by some of the most preeminent scholars of American art. Amidst these moving testimonies is the work. The stunning drawings, studies, paintings and powerful portraits that capture the “frozen motion” that Wyeth was seeking throughout his life. WYETH will build a life, layer by layer, much in the way Andrew Wyeth created his exquisite master paintings–meticulous study followed by layer upon layer of tempera. Q&A with the filmmakers to follow.